Ransomware Kovter is delivered e.g. through a malicious email attachment named Court_Notification_0000928697.doc.js. The developers of this script take security really serious. (1)          call %TEMP%\a1.exe -mx0 -mhe -p"<Encryption Key>" "%i.crypted" "%i"
The encryption program a1.exe (1) creates an encrypted copy with extension crypted, In the next step the script deletes (2) the original file. If the download is successful command a9.exe -a -q is used to delete the original file. SDelete implements the Department of Defense clearing and sanitizing standard DOD 5220.22-M, to give you confidence that once deleted with SDelete, your file data is gone forever. With this it is not possible to recover the deleted files with disk utilities or with the help of a data rescue lab. In this case the java script loads two encryption programs from the attacker’s download servers. A2.exe is identified as Trojan:Win32/Dynamer!ac (Microsoft) or BehavesLike.Win32.Ramnit.cc (McAfee Gateway Edition), A1.exe as Trojan:Win32/Kovter!rfn (Microsoft) or Trojan-FIMO!571F44310A86 (McAfee Gateway Edition). The script is identified as TrojanDownloader:JS/Nemucod.FG (Microsoft) or JS/Nemucod.ie (McAfee Gateway Edition). Take care! And have a good weekend. 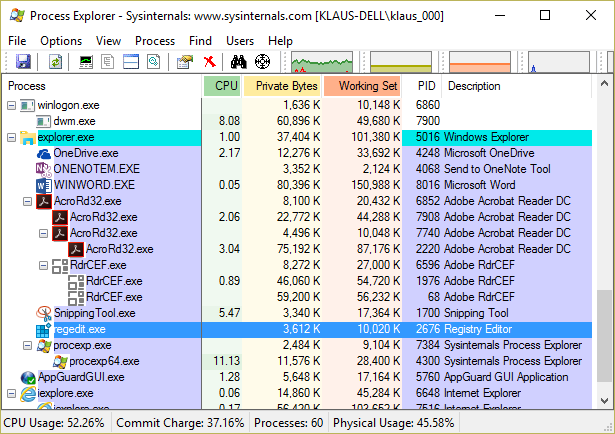 This entry was posted in New Technology, Opinion and tagged AppGuard, Kovter, Sdelete, Trojan:Win32/Dynamer!ac, TrojanDownloader:JS/Nemucod, User Space, Windows Systinternals on June 25, 2016 by Klaus Jochem. 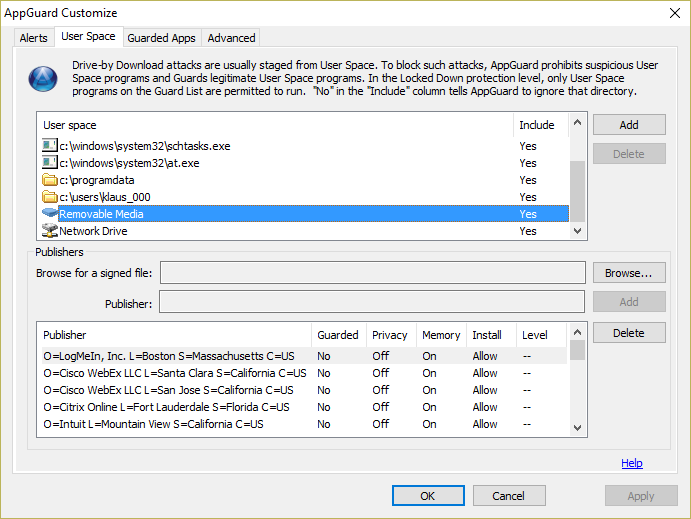 Preventing the execution of whatever scripts or executables from User Space is one of the basic security concepts of AppGuard. Unfortunately, the User Space concept does not work in the case of fileless malware. A very prominent representative of this malware type is Poweliks. Poweliks was first detected in August 2014. It hides its payload in the Windows registry, no file is written during the first infection phase. Memory protection is designed to prevent one process (originator) from altering or reading the memory of another process (target). Attackers try to re-allocate memory, place executable code into the newly allocated memory, and then execute this code. This type of attack is known as memory code injection and memory scraping. This attack has been widely used in file-less malware which exists only in memory, and Trojan downloader type of malware. In Protected mode icons and process descriptions are no longer displayed. 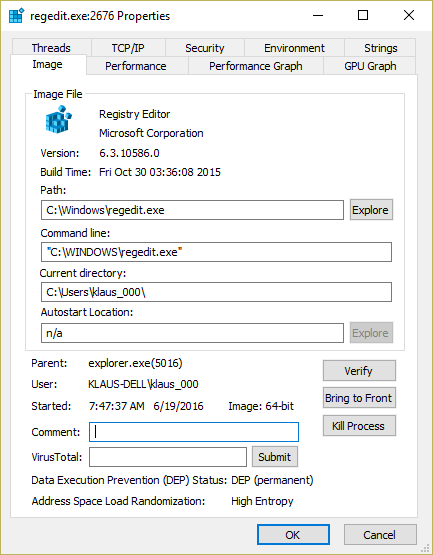 Process Explorer retrieves these details from the process memory, and MemoryGuard blocks read access. In Protected mode important process details are no longer displayed. 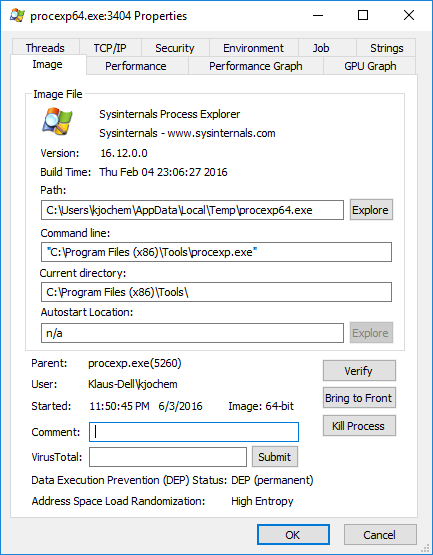 Process Explorer reads these details from a process’ memory and displays them in the Properties dialogue. 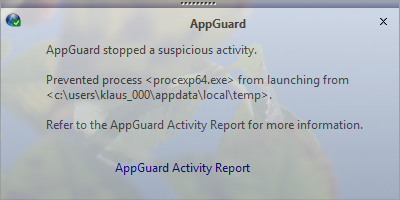 If AppGuard is operated in the default mode Protected, MemoryGuard blocks this reading operations, thus details about the process cannot be retrieved. 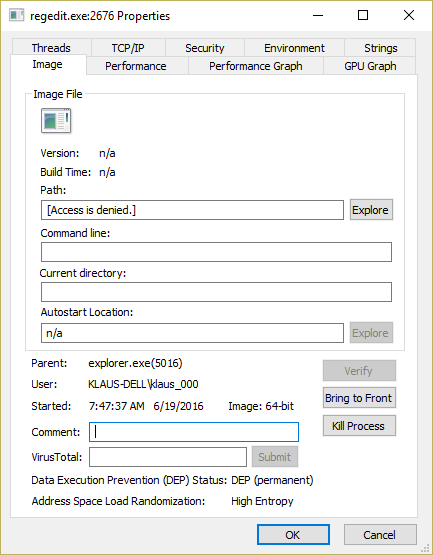 This entry was posted in New Technology, Survival tips and tagged AppGuard, Blue Ridge Networks, Fileless malware, Kovter, McAfee Labs, MemoryGuard, Poweliks on June 19, 2016 by Klaus Jochem. 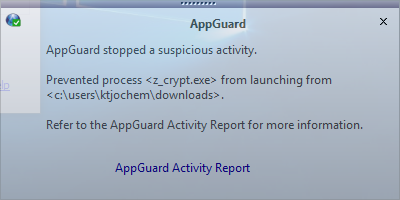 During my test of AppGuard some new variants of ransomware showed up in the wild. ReaQta reported a new and massive worldwide Locky ransomware spam campaign. The new variant downloads the payload in encrypted form from the attacker’s command and control server and decrypts it before execution on the victim’s system. This makes it harder for traditional anti-malware systems to identify the payload as malicious. Since the decrypted version is executed from User Space AppGuard blocks the execution. AppGuard runs out-of-the-box in protection mode Protected with default User Space settings. More about AppGuard next week. This entry was posted in New Technology, Opinion, Survival tips and tagged AppGuard, Blue Ridge Networks, Locky, Ransomware, ZCryptor on June 11, 2016 by Klaus Jochem. 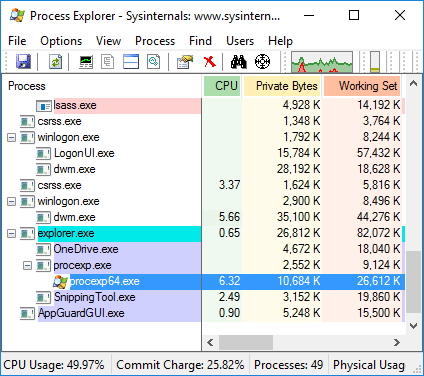 Sysinternals Process Explorer is one of my favorite tools. And the best tool to gain an insight into the operations of Blue Ridge Networks AppGuard. 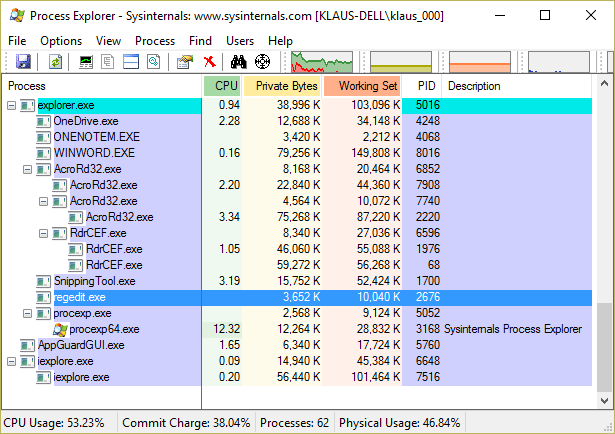 When Process Explorer starts in Windows 10 (64 bit Version) the process is started as a child process of the user’s Explorer process. 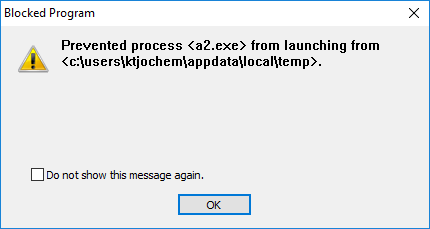 This start process extracts the 64 bit version of Process Explorer to the local temporary files directory C:\users\kjochem\AppData\Local\Temp\procexp64.exe and runs the 64 bit version from this directory. Modern Windows operating systems protect themselves against unintentional changes by users. They restrict change access of users to few directories, e.g. to directory C:\users\<username> in the so-called User Space and prevent write access to the System Space, e.g. C:\windows\system32, unless the user does not work with administrative privileges permanently. When a user opens a weaponized Word document the Word application is executed in User Space. Thus the Word macro can write commands for the download of malicious content from the attacker’s command & control server to the User Space only. And downloads must be stored in User Space, and thus executed from User Space. The script below shows how state-of-the-Art malware works. The commands are created by the AutoOpen macro in Word document 839482-Invoice-April.docm, which is identified as e.g. TrojanDownloader.Agent.BEO by ESET-NOD32, W97M.Downloader by Symantec, or WIN32/Spursint.A!cl by Windows Defender. In this example the (1) andax.exe is downloaded to the user’s APPDATA directory and started (2) from the APPDATA directory afterwards. Shell Variable APPDATA expands on evaluation to C:\users\kjochem\AppData\Roaming. The same holds for Drive-by Downloads. In the absence of write access outside the User Space the payload of Drive-by Downloads is stored in and executed from User Space. 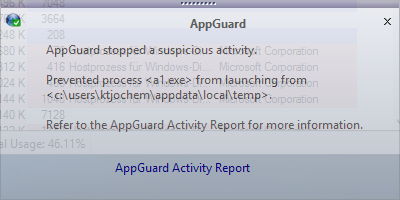 AppGuard blocks such attacks by preventing the execution of suspicious programs from User space. Quite simple, but very effective. This entry was posted in New Technology, Opinion and tagged AppGuard, Blue Ridge Networks, Locked Down Mode, W97M.Downloader, WIN32/Spursint.A!cl on June 4, 2016 by Klaus Jochem.